If you’ve not had the fortune to experience the Great Lakes during summertime, you are in for a treat. Picture the Caribbean without the palm trees – water so clear you can see the bottom twenty feet down and beaches so pristine they are often labeled as “sugar sand.” What could be better? Combine a Great Lakes summer setting with over 120 vintage trailers and motor coaches at the annual Port Crescent Vintage Camper Show. The Michigan event is hosted by the Tin Can Tourists (TCT), the oldest and largest vintage camper club in the world. Founded in Tampa, Florida in 1919, their original mission was to promote fraternity and friendliness among campers and the communities where they stopped. Today, the organization has over 2,000 North American members and chapters in three countries. And, while still honoring their founding principles, they also encourage the promotion and preservation of vintage trailers and motor coaches through gatherings like the Port Crescent event. I spoke with John Truitt, TCT Hall of Fame member and organizer of the show who noted that this year was the 10th anniversary of the Port Crescent show. He said, “The original show in 2008 had only 13 units – this year, I could have easily booked the entire park. I ended up with 40 units on a waiting list.” More than 200 people were registered and brought 120 vintage campers. Primarily, registrants came from the Midwest but some came from as far away as West Virginia and Virginia. TCT gatherings have a daily roster of social activities, meals, and events. Each year’s show carries a theme; this year’s was “Peace, Love, and Flower Power” celebrating the Hippie era. Rigs were emblazoned with peace signs and psychedelic colors while their owners were dressed like flower children. The theme explains why a 1935 Bowlus Special Road Chief showed up as the Beatles’ Yellow Submarine. Co-owner Jeanne Bosch told the exciting story of how she and her husband acquired such a rare trailer. She said, “It was a pure fluke we were able to acquire a Bowlus, let alone afford one.” For nearly a year, her husband Brian searched online daily during his lunch hour, eventually stumbling upon an obscure comment on a blog about this Bowlus possibly being available for sale. It was located in Santa Rosa, California. The owner and his wife had shared many years traveling in the trailer; after his wife had passed away he was understandably sentimentally attached to the trailer and not ready to sell to just anyone. Brian said, “The owner was so selective, that we had to essentially pass an interview and even spend the weekend before agreeing to sell it to us.” While it was a rare find, it required a flatbed to bring it home and eventually an aircraft mechanic’s help with the rivets. Doug Campbell echoed similar sentiments, “When you first start, it’s all about the trailers. After a while, it’s all about the people.” His rig was a rare 1959 Sun Cruiser. He said that Sun Cruiser was started by former employees of Shasta and the trailers built almost identically to Shasta models – all the way to mounting similar “wings” on the roof. Shasta eventually sued for patent infringement putting Sun Cruiser out of business. Only a handful was ever made and Campbell was fortunate to acquire one. An aviation enthusiast, Campbell said “I came into the hobby nine years ago because I wanted a camper to serve as lodging for the Oshkosh aviation show. 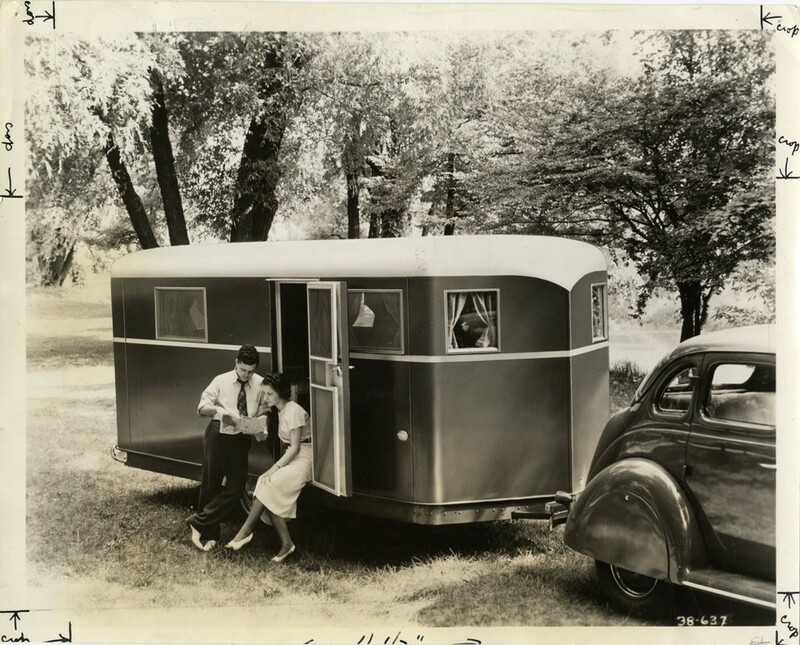 I was originally going to build one, but stumbled upon the Sun Cruiser first.” The camper had been used as a hunting cabin and was in very poor shape, requiring replacement of all the interior wood. Ironically, he’s yet to attend the Oshkosh air show but has participated at the Port Crescent camper show for the last 7 years. He even helped form a group called “Unhitched” which provides an outlet for vintage camper lovers to gather in the winter. More than trailers were represented; there were a few motor coaches and even a 1976 Wolverine pickup truck camper owned by Delta Colling from Fostoria, Michigan. He bought the unit new 42 years ago and said that the Wolverine company was founded in nearby Gladwin, Michigan and also made trailers and 5th wheels before ceasing operations in 1980. Port Crescent State Park is typical of the kind of great facilities that the TCT reserves for their events. The 640-acre park is located near the top of what is commonly referred to as Michigan’s “thumb.” Open year-round, the park offers swimming, fishing, canoeing, hunting and cross-country skiing. There are three miles of shoreline along Saginaw Bay on Lake Huron with beaches, a 900-foot boardwalk, an accessible fishing pier and five scenic picnic decks on the dunes. Three trails ranging from ¾ mile to 3.5 miles serve hikers. Because of the park’s location slightly west of the tip of the thumb area, sunsets are stunning. The park is also a dark sky preserve (one of only seven in Michigan) which is protected against light pollution and offers exceptional stargazing. There are 137 modern campsites; 17 of the sites are either waterfront or water view. Most sites have 20/30 amp electric service. Certain sites will accommodate larger travel trailers up to 50’. Shower facilities are adjacent to sites and the park provides a sanitation station and firewood vending. For those who want to tour locally, the quaint town of Port Austin has ample shopping, dining, and activities. The scenic town and surrounding area offer numerous festivals, a farmers market, golf, kayaking, canoeing, and horseback riding. It’s also an ideal area for spectators or photographers wishing to capture landscapes, wildlife, water views, or ice formations on Lake Huron in the winter. For visitors with maritime interests, there’s an underwater park of 19th-century shipwrecks that can be explored by divers and snorkelers. There are three lighthouses in the area, a half-mile walkable breakwall along the Port Austin harbor and both charter boats and public access for fishing.